Cities these days are more than just skyscraper skylines. With rivers, trails, and open space strategically incorporated into urban development plans, these 12 destinations are keeping the adventure within city limits. Fun fact: The Washington Canoe Club was founded on the banks of the Potomac River in 1904 and has turned out numerous Olympic medalists such as Frank Havens and Francine Fox. According to the 2017 ParkScore index created by the Trust for Public Land, 97% of D.C. citizens live 10 minutes or less from a public park. Granted, those parks are, on average, only one-and-a-half acres in size, but when you look at the big picture of open space versus development, that’s 22% of the city designated specifically for parks. That juxtaposition between nature and culture creates an incredibly accessible opportunity for D.C. residents and visitors alike to get outside. For Brown People Camping founder Ambreen Tariq, the fact that recreation infrastructure was so seamlessly woven into the fabric of the city only added to the vibrancy that initially drew her to the city. Bring some comfy kicks, says Tariq. The city is incredibly walkable with multiple pathways designed exclusively for pedestrians and cyclists. “Rock Creek Park is one of my favorites,” says Tariq. The 2,100-acre National Park Service unit is interlaced with more than 32 miles of hiking and paved biking trails. More of a water person? Boating in DC rents paddleboards (from $22 per hour) and kayaks (from $16 per hour). Float the Potomac River on your own or take a lesson (starting at $35). After a day outside, refuel at any number of top-notch restaurants in the area. There are too many to list here, but a few of our favorites are Tico for Latin American, Little Serow for Thai, or Pearl Dive Oyster Palace for seafood and cocktails. Post up for the evening at an affordable spot like D.C. International Hostel ($25 per night), or head outside of D.C. proper, where the city of Arlington offers just as convenient lodging at half the price. Stargaze at the Rock Creek Park Planetarium (free). Tour gardens and contemporary art exhibits at Dumbarton Oaks Garden ($10 for adults). Pay homage to ol’ Teddy at Theodore Roosevelt Island. Ride the C&O Canal to Great Falls Park (if you’re a stout paddler, you can kayak this legendary class V run, too). Fun fact: National Black Marathoners Association Running Hall of Fame inductee and Charm City native Marilyn Bevans was the first African American woman to run a marathon and won the 1977 and 1979 Maryland Marathons. Baltimore’s idyllic setting on the Patapsco River makes it one of the most iconic cityscapes in the country. Sailing, fishing, and crabbing are deeply ingrained in the city’s history and continue to be a trademark of Baltimore’s identity. In recent years, efforts by the Waterfront Partnership of Baltimore have substantially cleaned the harbor of pollution through the use of floating wetlands, of which Baltimore has more than 2,000 square feet. Last March, the city of Baltimore released its Green Network plan, which will revitalize abandoned lots and turn them into small open spaces. In turn, these micro parks will connect Baltimore’s growing bike and foot corridors, as well as the city’s 4,600 acres of green space. The Baltimore Greenway Trails Coalition is in the process of finalizing a 35-mile urban trail system that will unite the diverse neighborhoods and natural resources that Charm City Run Assistant Manager Blair Wooton says defines her city. Who needs a segway when a pair of running shoes can get you around just fine? 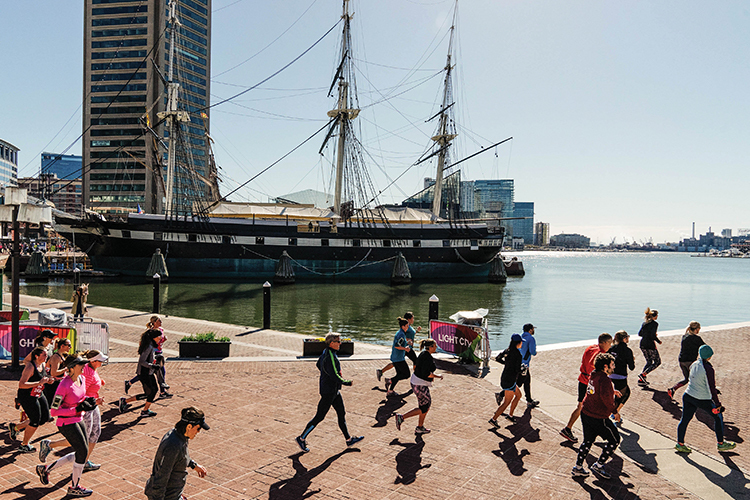 Check out Baltimore’s thriving running scene during the annual Baltimore Running Festival on October 20th or take a jog on your own via Jones Falls Trail, a hiking and biking trail that runs for 10 miles from the Inner Harbor to Mount Washington Light Rail Station. To experience the Patapsco at its finest, rent a kayak from Shallow Creek Kayaks for a half-day ($40) and watch the sunset over the city. Anglers can cast a line at any of the three license-free fishing locations, which include Canton Waterfront Park. 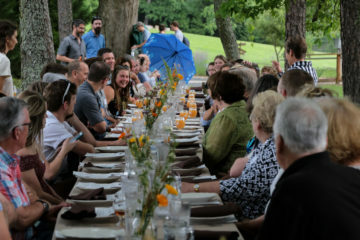 At day’s end, eat fresh from the water at Thames Street Oyster House before throwing up a tent at Patapsco Valley State Park just south of town. Sites start around $25 here and are centrally located to the state park’s expansive 200-mile trail system and namesake river. Paddle and rally at the Baltimore Floatilla on June 9th. Ride bikes around Lake Montibello. Learn about wildlife at Carrie Murray Nature Center. Gawk at the aquatic life in Baltimore Aquarium ($25). Fun fact: The Dirty Dozen Bicycle Race, now in its 36th year, is one of the toughest road races in the region, weaving cyclists in and out of the city for 50 miles and up the 13 steepest hills in town, including the 35% gradient “steepest street in the world,” aka Canton Avenue. 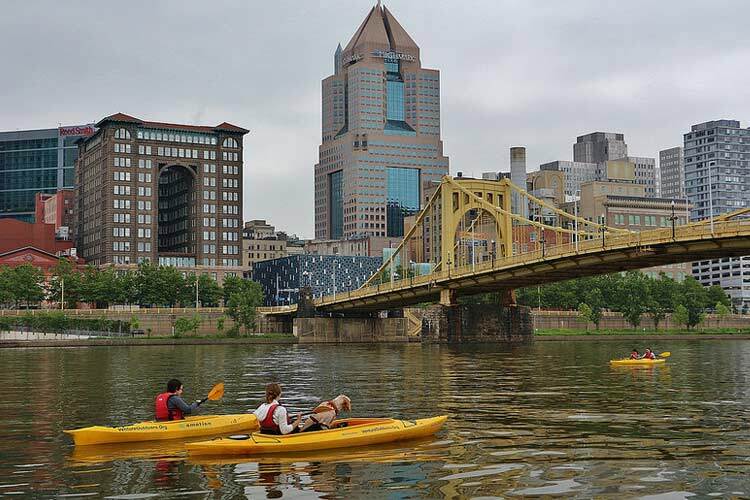 Located at the confluence of the Allegheny, Monongahela, and Ohio Rivers, it’s no surprise that Pittsburgh is leading the charge when it comes to prioritizing outdoor recreation as an economic engine. Pittsburgh’s five city parks total over 2,000 acres in size, not including Point State Park or the various riverfront parks like Three Rivers and North Shore. Boats, bikes, and beer are big in the ‘Burgh (as are the ‘Stillers,’ but save the football for another visit). Check off the first by renting a kayak from Kayak Pittsburgh and joining the brand’s parent company Venture Outdoors on a group paddle. For cyclists, the options are far and wide. All of Pittsburgh’s city parks are crisscrossed with trails ranging in style from cross-country to skills parks and everything in between. North Park and Frick Park are two of the more popular riding destinations and are ideally situated close to downtown. There are a few beginner-friendly rides here, but the vast majority of trails are intermediate and advanced. Once you’ve worked up a sweat, stop in at the OTB Bicycle Cafe for burgers, mind-blowing vegan options, and of course, some local suds (try the Hazedelic Juice Grenade from Grist House Craft Brewery). The closest and coolest camping in town is located at Cecil Henderson along the Montour Trail rail-trail. There’s no fee to camp here, but the caveat is, you have to ride there to reach it (and we’re all about that). Ride the Great Allegheny Passage. Tour Bicycle Heaven Museum, the world’s largest bicycle museum (free). Rip inside at The Wheel Mill, an 80,000-square-foot indoor bike park ($23-29 per day). Get inspired and get happy at Randyland. Fun Fact: In 2015, Richmond played host to the UCI Road World Cycling Championships, igniting a citywide revamp of cycling amenities for locals. Visit Richmond’s crown jewel Belle Isle on a sunny weekend day and it’ll feel like a modern day spoof on the famous Georges Seurat painting A Sunday on La Grande Jatte: river-smooth rock outcroppings jutting out into the sparkling waters of the James River, crowds of college kids sprawled out on blankets while rafters and kayakers plunge through class IV rapids just a few yards beyond. This 54-acre island sanctuary has it all—singletrack, a climbing wall, historical ruins—and it’s just a tiny slice of Richmond’s adventure pie. 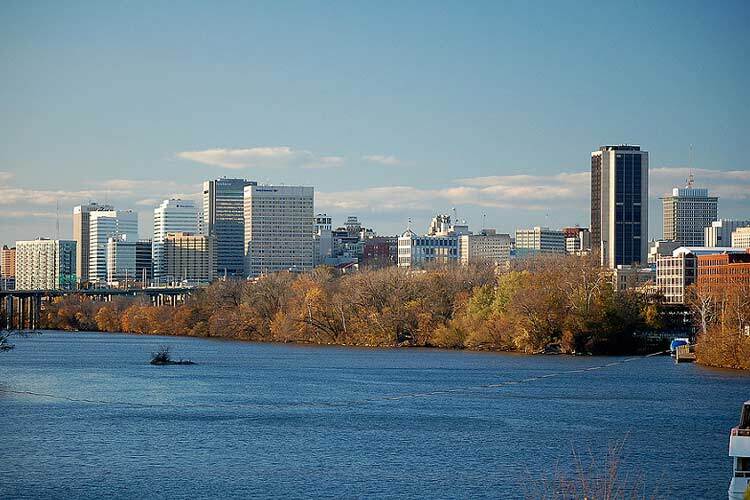 The James River is at the heart of Richmond’s adventure scene, whether you’re experiencing it by boat or admiring it from the riverside trails. Splash down the class III-IV section of the James with RVA Paddlesports, which offers rafting trips down the Lower for $60 a pop. Save some steam for a ride in the James River Park System. With multiple trailheads, you can make your ride as short or as long as you like, though Rutledge recommends linking all of the trails for a 20-30-mile roundtrip ride. Once you’re sufficiently spent, pull up to Legend Brewing Company for some après vibes. The brewery is just a few blocks off trail and is known for its stick-to-your-ribs burgers (sub black bean or Portobello for you veggies). About 20 miles down the road is Pocahontas State Park, where you can pitch a tent ($33) or rent a cabin ($47). Ride the 52-mile Virginia Capital Trail to Jamestown and catch a lift back with Cap Trail Bike Shuttle ($15-38 per person, depending on the pickup point). Stroll through history along the Richmond Liberty Trail. Catch a show at The National. Fun Fact: Until the 1920s, West Virginia’s capital was a major player in the salt industry thanks to the many salt deposits found along the banks of the Kanawha River. Like much of the state, West Virginia’s capital city has a long history of coal mining. For decades, the Kanawha and Elk Rivers were used primarily as an industrial highway for coal barges. Those days are over, and in the past few years, the energy in Charleston has shifted away from resource extraction and toward outdoor recreation. “We’re leading the fight and trying to create that community culture in Charleston,” says Appalachian Boarding Company and Charleston native Evan Young. “We have an opportunity here and all of the stoke going on over in Fayetteville is trickling down right here in Charleston. Only seven miles from downtown Charleston is Kanawha State Forest, a 9,300-acre state forest that at one time was the site of extensive logging and mining. Mother Nature has since recovered what was rightfully her own, and the forest is now home to a diverse array of birds and more than 25 miles of mountain bike trails. Closer to town is Coonskin Park, which has a disc golf course, river access to the Elk, and an outdoor amphitheater. 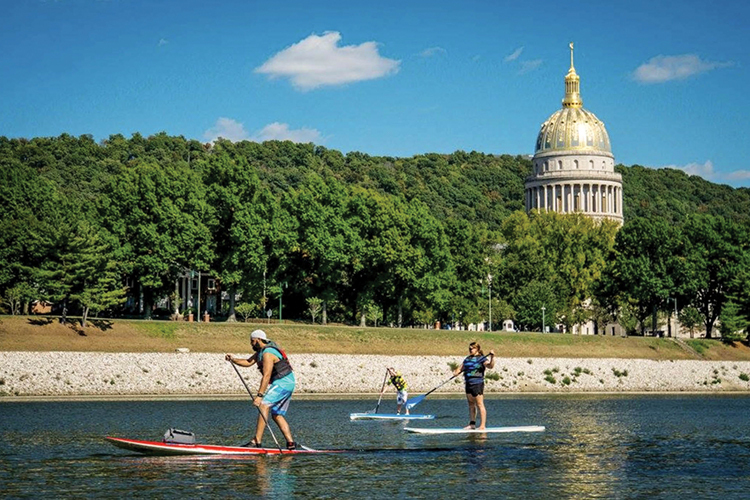 Rent a SUP for the day from Appalachian Boarding Company ($60) and listen to Live on the Levee from the water every Friday of the summer. The company will be located on Magic Island each Friday to rent boards, provide instruction, and lead the inaugural Sunset Sprint SUP series. To see a unique angle of the gold-domed capitol building, put in at Daniel Boone Park on the Kanawha and float just over four miles downstream through downtown Charleston. At night, check out the newly opened beer and burger joint Gonzoburger or, for more vegetarian-friendly options, head to Bluegrass Kitchen. Primitive and electric sites are available at Kanawha State Forest starting at $21.60 per night. Watch a live recording of the Mountain Stage. Walk through Capitol Street. Have lunch in Davis Park for a free Brown Bag Concert Series. Fun Fact: The Kentucky Wheelmen was founded in the 1880s and was one of the first organized groups of cyclists in the country. Members today restore and ride bicycles made prior to 1918. Don’t get us wrong, we love Kentucky’s bourbon and derby, but in just a few years, Louisville has completely transformed itself into a progressive city spilling over with bikes, parks, and yes, bourbon, too. The city has a long history of cycling, which started in the late 1890s with the Louisville Wheelmen. Today, the bike is a major part of Louisville’s identity. The city regularly hosts national cyclocross championships, has recently unveiled its VeloLou bike share program, and will soon complete construction of a 100-mile bike loop that circumnavigates the city. The Parklands of Floyds Fork is Louisville’s pride and joy. At 4,000 acres, this park system is one of the largest metropolitan parks projects in the nation. Rent a bike for $10 per hour from Blue Moon Canoe & Kayak of Kentucky and explore the trails at Turkey Run Park or build your skills at the Silo Center Bike Park. 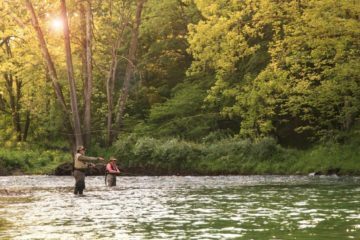 Anglers can grab a fishing license for $23 and wade the waters of Otter Creek Outdoor Recreation Area ($3 per day), where the smallmouth and spotted bass fishing is some of the best in the region. 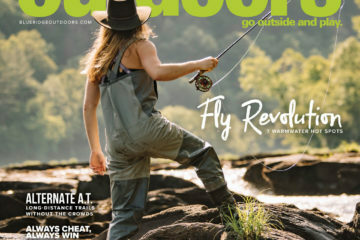 If you’re good enough, you might even land a rainbow trophy trout. For food, we like the 1930s’ vibe at Jack Fry’s, a blast-from-the-past southern eatery with nationally acclaimed dishes. For good pub food and craft beer that’s holier than thou, check out Holy Grale. Camping is less than a half hour from town at Horine Reservation. 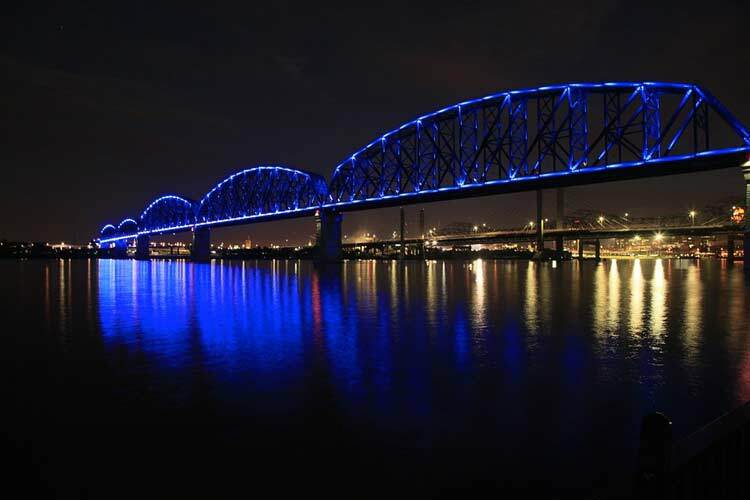 Cruise the Belle of Louisville, one of the country’s oldest operating steamboat ships. Try underground mountain biking at Louisville’s 320,000-square-foot Mega Cavern. Fun Fact: The city’s nickname “City of Oaks” traces back to the year 1844 when then-presidential candidate Henry Clay composed the infamous “Raleigh Letter” while sitting beneath an oak tree with a 100-foot-wide canopy. Known primarily as one of the South’s technology hubs, Raleigh has long touted that it’s two hours from the beach and four hours from the mountains. That central location has been a major attractant for Raleigh transplants, but now, the city is finding more and more ways to incorporate those adventures right in its own backyard. To date, the city has over 180 miles of greenways, connecting local landmarks like the North Carolina Museum of Art and William B. Umstead State Park. Currently in the works for Raleigh’s future is the Falls Whitewater Park, which will be located at the base of Falls Dam on the Neuse River and should be completed in the coming years. 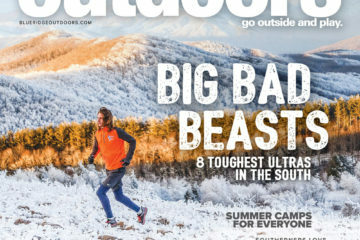 Trail runners will love William B. Umstead State Park for its quiet trails and gorgeous pine-choked forest. Despite its proximity to the bustle of the city, run just a half-mile from the parking lot and the sounds of traffic dissipate to silence. Another popular run just 12 miles from downtown is the Falls Lake section of the Mountains-to-Sea Trail, which can be as easy or epic of a run as you make it. Cyclists should drive northwest out of Raleigh to ride the flow trails at Lake Crabtree County Park. The lake is also a beautiful spot for flatwater paddling and boats can be rented for $7 per hour. The Neuse River is another great place for kayaking, especially at higher flows when the class II-III rapids come in. Around 2,000cfs, there’s some awesome playboating near the dam, which has been the major impetus behind the whitewater park movement. When you’re done playing, grab some James Beard-worthy southern fare at any one of Ashley Christensen’s restaurants. This rockstar chef-proprietor owns Beasley’s Chicken + Honey, Chuck’s, and Fox Liquor Bar. 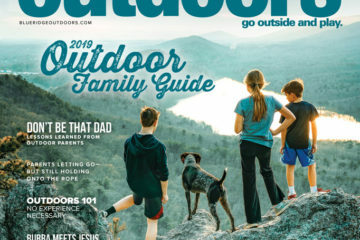 For just $25 you can pitch a tent back at William B. Umstead State Park without ever leaving city limits. Join the Wednesday night road ride and pizza party every week at Crank Arm Brewing. Pack a picnic and catch some music at Dorothea Dix Park. Tour the North Carolina Museum of Natural Sciences. 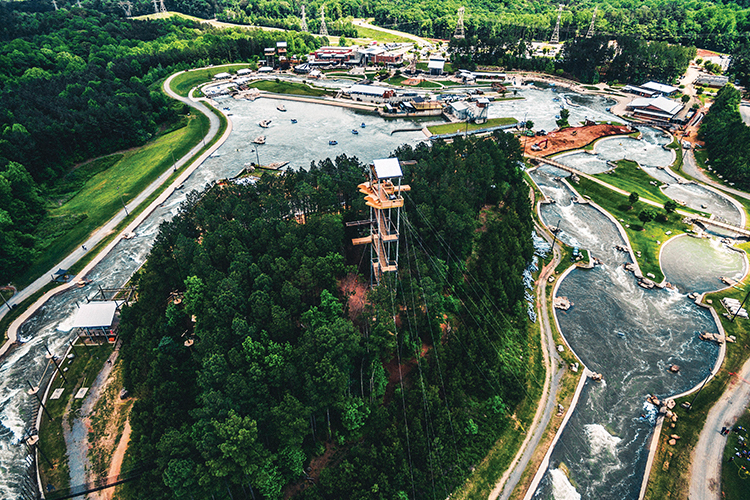 THERE’S SO MUCH TO DO AT THE U.S NATIONAL WHITEWATER CENTER IN CHARLOTTE, N.C.
Fun Fact: The U.S. National Whitewater Center in Charlotte is the world’s biggest manmade whitewater river and is home base for a number of Olympic-level paddlers. Long before Charlotte gained a reputation for being an adventure destination unto its own, the city had already made its mark as an easily navigable city with Uptown at the forefront of that movement. Building pedestrian and cyclist infrastructure has been a natural progression of Charlotte’s transportation system. Now, the nearly 40-mile greenway system is part of the much larger 15-county Carolina Thread Trail and serves as a model for other cities looking to incorporate non-motorized paths into their urban development. That’s something U.S. National Whitewater Center’s (USNWC) Communications & Brand Manager Eric Osterhus is excited to see. Having grown up in the Charlotte area as a kid, he says Charlotte has really stepped up to the plate to make the entire Charlotte experience one-of-a-kind. First stop, USNWC. 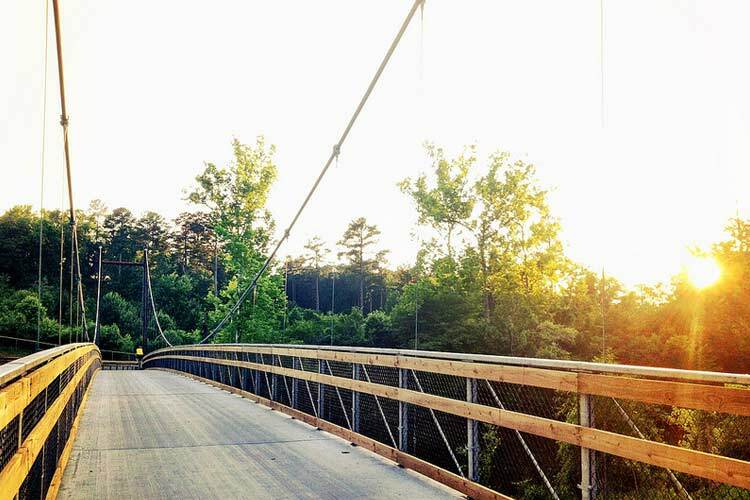 Whether you’re a climber, paddler, mountain biker, or trail runner, the Whitewater Center has it all. 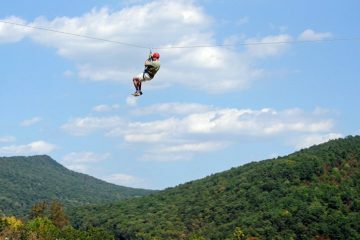 For just $59, you can buy a day pass and try everything, including zip lines and ropes courses. This place packs some serious adventure punch, and there’s no doubt you could spend an entire day here and hardly scratch the surface. For a less adrenaline-fueled outing, we like Reedy Creek Nature Preserve, which protects 927 acres of stunning forest within Charlotte proper. There are more than 10 miles of hiking trails in the preserve, so come, stroll, sit, study, and be. 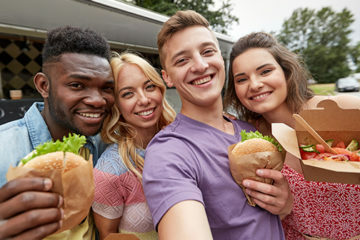 Grab a light lunch from local purveyors at 7th Street Public Market or Earl’s Grocery, then grab a campsite at Lake Norman State Park (starting at $15 per night). There’s plenty of swimming ($5 per day), paddling (canoe rental for $5 per hour), and mountain biking here to keep you busy for another day. Bike the Little Sugar Creek Greenway. Revel in art and nature at the Daniel Stowe Botanical Garden ($12.95). 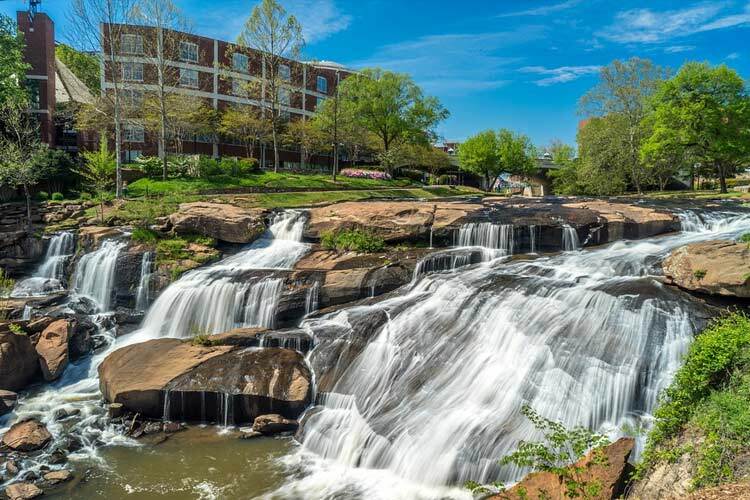 Fun Fact: Greenville started out in the mid-1700s as a grist mill and trading post, located right at the base of Reedy River Falls where Falls Park is today. 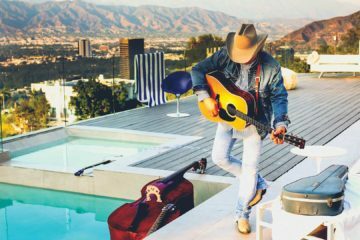 Positioned right at the foothills of the Appalachian Mountains, this southern city has undergone a total face-lift over the past 30 years. Like many Main Streets in the ‘60s and ‘70s, Greenville’s downtown sector had deteriorated into abandoned storefronts and crumbling buildings. Now considered the city’s most iconic feature, the 60-foot Reedy River Falls was once covered almost entirely by Camperdown Bridge, which not only prohibited the aesthetics of the river but also covered up the unsightly activities happening along the Reedy’s banks. Today, downtown Greenville is alive with activity and at its core is Falls Park, a 20-acre green space along the Reedy River completed in 2004. The city is continuing to clean up the Reedy River, which was once seen as little more than an industrial dumping ground. That commitment to the environment has in turn allowed for the energy built downtown to trickle upstream of the city. See the Falls Park for yourself by hopping on a bike. Rent a cruiser from the Swamp Rabbit Inn Bike Shed (starting at $15 for a half-day) and cruise through downtown Greenville via the Greenville Health System Swamp Rabbit Trail. This paved rail-trail is 20.6 miles in length and connects the city of Greenville with the nearby town of Travelers Rest. Once you get to “TR,” as the locals like to call it, stop in at Tandem, a super hip, bike-friendly crêperie located just off trail. More of a mountain biker? Check out Paris Mountain State Park just outside of the city. There’s about 11 miles of quality singletrack here, which vary from fast and flowy to moderately technical. In the evening, head over to Piney Mountain Bike Lounge for some good beer, great company, and a few laps around the pump track out back (free for all riders). 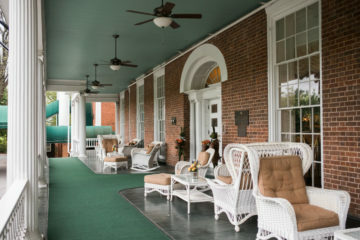 The Swamp Rabbit Inn offers a wide variety of chic lodging, from town houses to cozy cottages, all of which are conveniently located on or near the Swamp Rabbit Trail. Grab a room for you starting at $101 per night. Paddle Lake Jocassee. Hike to the Table Rock overlook at Caesars Head State Park. Hunt for waterfalls at Jones Gap State Park. Fun Fact: Within city limits alone, Knoxville has over 4,500 acres of parks and green space, which includes the 1,000-acre Urban Wilderness. Knoxville is an hour’s drive from Great Smoky Mountains National Park, Big South Fork National River and Recreation Area, and the Obed Wild and Scenic River. Nearby towns such as Townsend, Tenn. and Gatlinburg, Tenn., are gateways to the Smokies with an abundance of outdoor offerings and well worth the drive from Knoxville. But within Knoxville’s city limits, there’s more than enough to satisfy any adventure craving. The Tennessee River flows through the southern edge of the city and the 1,000-acre Knoxville Urban Wilderness can be quickly accessed from most any point downtown. Thanks to the hard work of the Legacy Parks Foundation, mountain bikers and trail runners can have a consistent 50-mile singletrack experience all without ever leaving the city. 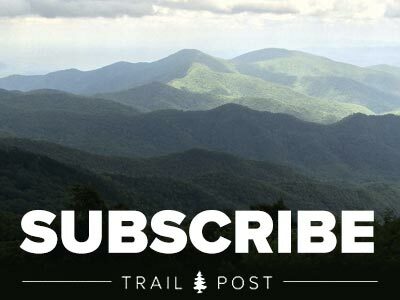 The signature 12.5-mile South Loop seamlessly connects some of Knoxville’s most popular parks, namely Ijams Nature Center, Forks of the River Wildlife Management Area, Anderson School Trails, William Hastie Natural Area, Marie Myers Park, and Baker Creek Preserve. The closest paddling to Knoxville is mostly flatwater or class I, but within a couple hours’ drive you can reach the French Broad and the Big South Fork, both of which are Southeastern whitewater gems. Rent a boat from River Sports Outfitters for $50 a day and paddle past the stone bluffs at Ijams Nature Center. If you’ve been out riding on the South Loop, pull up with your bike for tacos at SoKno Taco Cantina, which is conveniently located near the trail. Norris Dam State Park is a quick 30 minutes from Knoxville in Rocky Top, Tenn., and is about the closest camping you can find. There’s also hiking and fishing here, so you’re travels won’t be for naught. Hike at House Mountain Natural Area. Search for birds at Seven Islands State Birding Park. 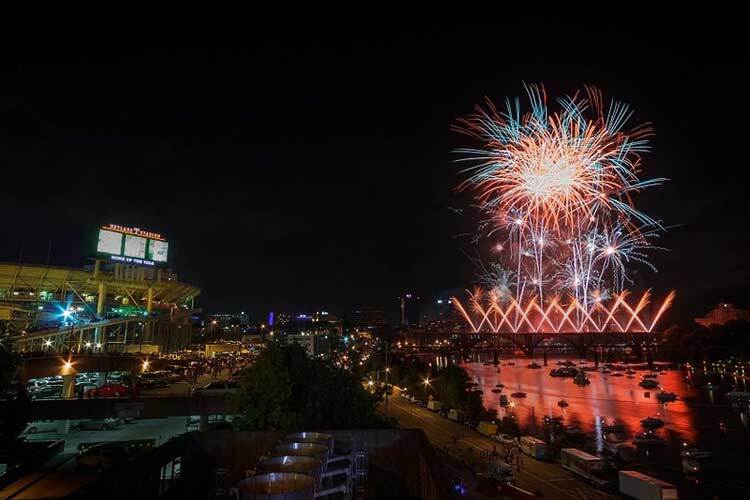 Fun Fact: In 2017, Chattanooga became the first city in the world to host all four IRONMAN events in one year: the IRONMAN 70.3, 140.6, and both the men’s and women’s IRONMAN 70.3 world championships. Back in the 1980s, the city of Chattanooga rose from the depths of de-industrialization despair and reinvented itself, starting first with a downtown revitalization investment that included, among many other wonderful things like the Tennessee Aquarium, a riverwalk. That riverwalk arguably changed the way ‘Noogans thought about their city, and today, Chattanooga is by far one of the top outdoor recreation destinations in the South. Start your day on the rocks at Foster Falls, the closest major sport climbing area to the city. The bullet-hard sandstone is textbook Southeastern climbing, and with more than 130 developed routes ranging from moderate 5.8s to a handful of legit 5.13s, there’s a route for every level of climber. Not a rope climber? 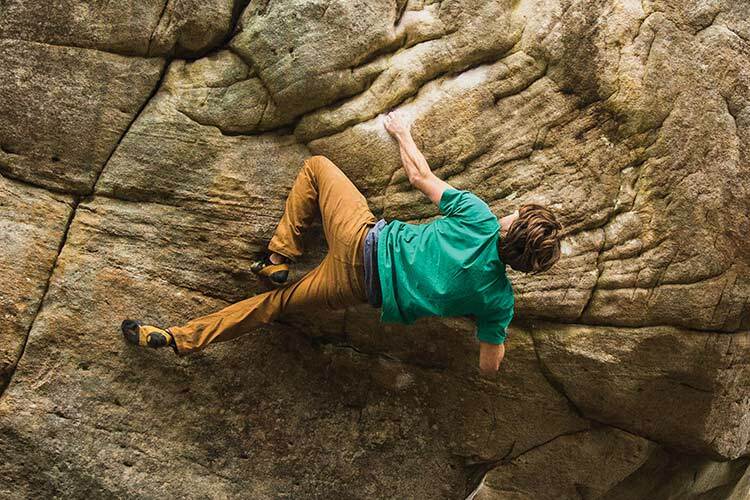 Check out the boulderfields at Stone Fort, which are so stellar that one of the largest outdoor bouldering competitions is held here every year (see Triple Crown Bouldering Series for more info). Acquired just last year, The Boulders on Old Wauhatchie Pike are the closest bouldering to town and are situated right at the base of Lookout Mountain. 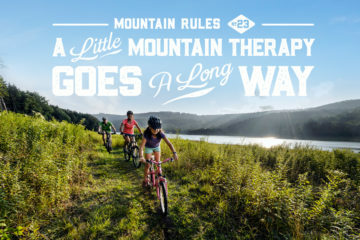 Mountain bikers have a variety of options, too, from the fast flow of Enterprise South Nature Park to the steep and technical rock gardens of Raccoon Mountain. Later in the day, swing over to the Flying Squirrel Bar for authentic farm to table cuisine and craft cocktails. When you’re good and full and tipsy, you need only stumble next door to the Flying Squirrel’s sister business The Crash Pad, a climber-friendly hostel with affordable rates as low as $35 per night. Explore Ruby Falls. Hike through Rock City. Peruse the Chattanooga River Market. Fun Fact: The city is located at the earliest navigable point of the Chattahoochee, which made Columbus a major industrial and commercial hub in the 19th and 20th centuries. Home of Coca-Cola and Wayne Brady, Columbus wasn’t known for much beyond those veritable claims to fame until the city beefed up the downtown section of the Chattahoochee River. 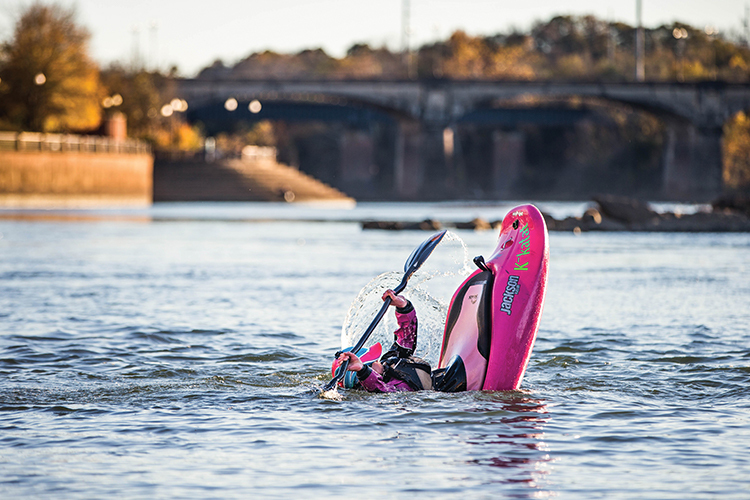 Now, their urban whitewater course ranks among the top 10 in the nation, with the two release levels offering everything from class II to class IV+ rapids. Raft high-volume rapids right through the heart of Columbus, Ga., with Whitewater Express. Individual rafting rates start at $38.50 for a low-water run and $49.50 for the high-water action (we recommend you go big or go home). The outfitter also offers canopy tours and aerial challenge courses for the vertically fearless. After your in-town rafting trip, cruise the Dragonfly Trail by bike. This 11-mile multi-use bike and pedestrian path weaves through the heart of the city and can connect to the 15-mile Chattahoochee Riverwalk. For dinner, bring your appetite to The Black Cow, famous for its fried green tomatoes. Lake Pines Campground in eastern Columbus provides tent sites for $24 per night and keeps you close enough to get to Plucked Up Chicken & Biscuits for breakfast in the morning. Fish for brown and rainbow trout in the Chattahoochee River and at West Point Lake. Browse Uptown Columbus at Market Days on Broadway. Dive deep into nature at Oxbow Meadows Environmental Learning Center. 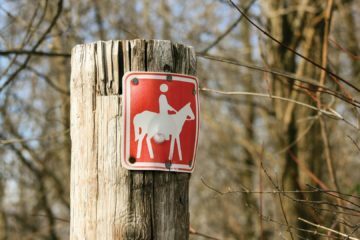 Bikers, Hikers, and Horses: Can We All Play Together Nicely?